He’s not ordering pizza; he’s going bananas. 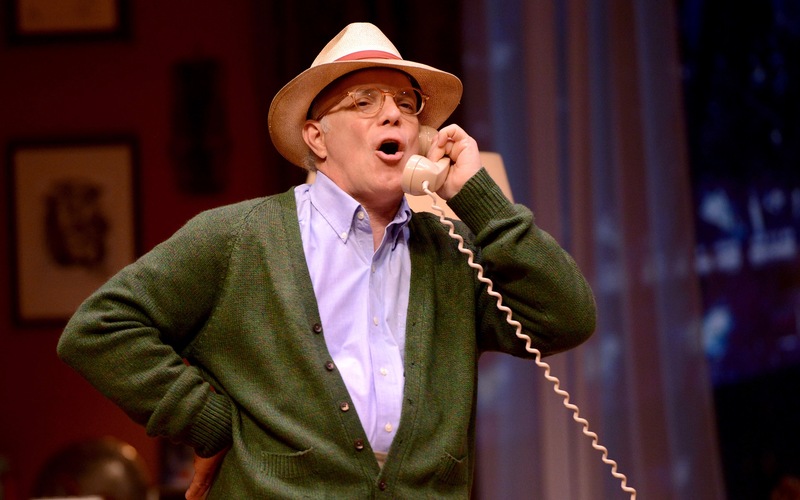 Eddie Korbich plays an off-the-deep-end Truman Capote in “TRU” at The Public, one of many items on the live theater menu. This website’s monthly previews are meant to give you more than just “listings” of upcoming shows. At Entertainment Central we try to convey the nature and feeling of each show—with a little background info, some color commentary, maybe some video links—so that even if you make gut decisions about what to see, your gut will have a well-informed mind of its own. And May is a good month for letting your intuition do the choosin’ because there is such variety to choose from. The schedule includes plays and performances to suit every taste, mood, and degree of procrastination. If you’re a quick decider you can catch the Ibsen classic The Master Builder, which finishes its Quantum Theatre run on May 1. Chronic ditherers can still be early birds by waiting for the very last day of May, when the touring production of Matilda the Musical (based on Roald Dahl’s novel) opens at Benedum Center. In between come numerous shows that are rarely staged or haven’t yet been staged in Pittsburgh. They range from a new play about a favorite American subject—winning (The Last Match)—to a 20th-century opera with a libretto co-written by English poet W.H. Auden (The Rake’s Progress). Plays based on works of fiction include Two Tales of Terror (adapted from stories by Poe) and The Giver; musicals range from Stephen Sondheim’s Assassins and Benjamin Scheuer’s one-man opus The Lion. Shows are previewed in order of run dates. Here in America we dutifully recognize Henrik Ibsen as one of the all-time great playwrights, but most of us aren’t very familiar with his plays. Quantum Theatre sets out to channel Ibsen at the height of his game with The Master Builder. The title character is an architect who has built a career on shaky foundations. His personal and business affairs are already riddled with intertwined conflicts when a mysterious young woman shows up, claiming to be his secret admirer and aspiring to be his muse. The Master Builder’s story is easy to follow but defies easy interpretation; it’s a parable wrapped in enigma—see our review for details. Quantum is performing the play at Building 2 in Nova Place (formerly Allegheny Center), corner of E. Commons St. and Allegheny Square East, North Side. ONE FLEW OVER THE CUCKOO’S NEST by Dale Wasserman (from Ken Kesey’s novel). Through May 7, barebones productions. What would happen if the inmates really tried to run the asylum? Ken Kesey posed that question memorably in his 1962 novel One Flew Over the Cuckoo’s Nest. The story unfolds in a psychiatric hospital similar to the place where Kesey, early in his writing career, had worked as a night-shift aide—and where he was introduced to LSD in a CIA-sponsored study of the use of drugs for mind control. The movie version of Cuckoo’s Nest (starring a young Jack Nicholson) is a classic but the stage play, by Dale Wasserman, has a unique power of its own: When live actors perform this drama, you feel as if you’re right there in the ward with them. Pittsburgh’s barebones productions is reviving One Flew Over the Cuckoo’s Nest at the New Hazlett Theater, 6 Allegheny Square East, North Side. THE RAKE’S PROGRESS (opera) by Igor Stravinsky. Through May 8, Pittsburgh Opera. 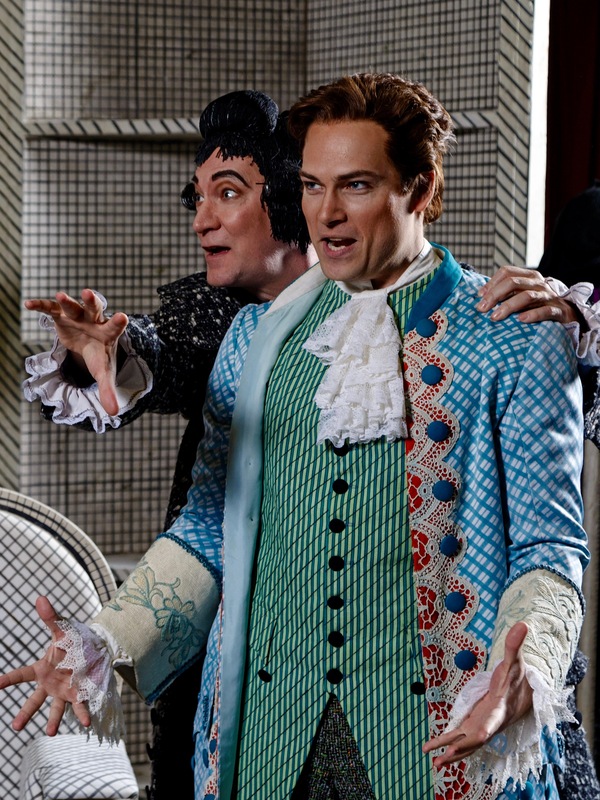 To cap its current season, Pittsburgh Opera delivers the Pittsburgh premiere of a modern gripper: The Rake’s Progress, which debuted in Venice in 1951. Igor Stravinsky composed the opera to an English libretto co-written by the poets W.H. Auden and Chester Kallman. If you have read Auden, you know you may be in for a wry and spooky tale, and so this one is. The “progress” referred to in the title is no progress at all. It’s the story of a young ne’er-do-well named Tom Rakewell, who blows his inherited fortune and much more in a life of increasingly sleazy dissolution. Pulling the strings behind Tom’s downfall is a mysterious figure called Nick Shadow—and in case any art lovers out there were wondering: Yes, The Rake’s Progress was inspired by a series of paintings done by William Hogarth, under the same title. Benedum Center, 237 7th St., Cultural District. FIRST DATE (musical) by Alan Zachary, Michael Weiner, and Austin Winsberg. Through May 8, Pittsburgh CLO Cabaret. Match-making websites have done little to add vision to the ritual known as blind dating. It remains an adventure. Fortunately, in the musical comedy First Date, it becomes a laughable song-and-dance adventure you can enjoy rather than participating in painfully. First Date premiered in Seattle (where else?) in 2012, made it to Broadway the next year, and is now being presented by Pittsburgh CLO in its intimate CLO Cabaret theater. The quandaries portrayed in this musical are by no means particular to the United States. The show has been licensed for translation and production worldwide, and is due to open soon in Buenos Aires. Meanwhile CLO offers the chance to catch First Date in its native English, with music and lyrics by the all-American team of Alan Zachary and Michael Weiner, and book by Austin Winsberg. Cabaret at Theater Square, 655 Penn Ave., Cultural District. THE LAST MATCH by Anna Ziegler. Through May 15, City Theatre. If the schedule at City Theatre always seems full of plays you haven’t seen before, this is intentional. The company is devoted to staging new and recent plays—every production is a Pittsburgh premiere and some are world premieres. The Last Match, by up-and-coming American playwright Anna Ziegler, debuted recently in San Diego and offers a seriocomic take on the ever-popular topic of winning. The story revolves around a fictional tennis match at the U.S. Open. Two high-strung men battle on the court while one player’s wife and the other’s girlfriend provide a running commentary, along with plenty of distracting interaction. In the San Diego premiere, The Last Match was performed with the actors swinging imaginary tennis racquets at imaginary balls. City Theatre is doing the play in its Hamburg black-box theater and the word is that no audience members will be harmed. (Also note that City offers a limited number of Pay-What-You-Want tickets for the May 7 show.) 1300 Bingham St., South Side. TRU by Jay Presson Allen. Through May 22, Pittsburgh Public Theater. There was a time when everybody knew who Truman Capote was. From the 1940s into the ‘70s—back when authors and other intellectuals could become superstar celebrities—Capote, a gifted writer, shined bright and then flamed out spectacularly. His stories and books (including Breakfast at Tiffany’s and In Cold Blood) sold big and stirred controversy. He was openly gay at a time when few dared. He was a Southern boy turned New York socialite; he partied with the rich and famous; he dazzled the public on TV talk shows and often alarmed the public, too—for he was slowly frying himself to death with drugs and alcohol. Jay Presson Allen’s play TRU, set in 1975, serves as both a chronicle of Capote’s heady life and a portrait of a man on the path to self-destruction. Pittsburgh Public Theater is staging TRU, a one-person show drawn from the author’s own writings and ramblings. At the O’Reilly Theater, 621 Penn Ave., Cultural District. Poe knew where the dark side is—it lives inside us. TWO TALES OF TERROR adapted from Poe’s short stories. May 5-20, PICT Classic Theatre. They’re baaack. PICT Classic Theatre, emerging from a financial crisis, returns for its 30th season with a show fittingly built around cliffhanger suspense. Two Tales of Terror is a back-to-back adaptation of a pair of Edgar Allen Poe’s stories, “The Tell-Tale Heart” and “The Fall of the House of Usher.” Both are considered to be among the most excellently creepy examples of Poe’s work, which is saying something, if you think about the rest of what he wrote. 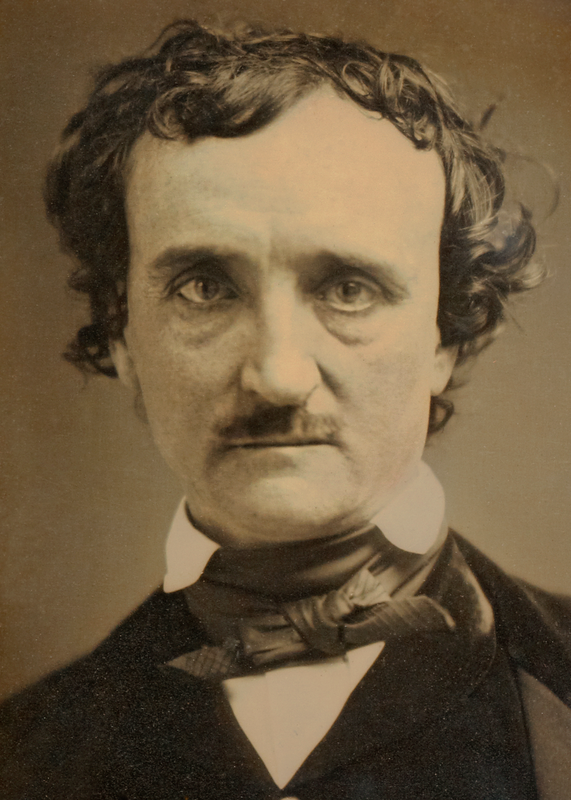 Poe is admired as a high-art writer because the terror and suspense in his fiction do not come merely from made-up monsters or plot contrivances. He wrote tales of psychological terror, in which characters have the kinds of fears and obsessions that any of us might have, except that in Poe’s hands everything is taken to harrowing extremes. PICT artistic director Alan Stanford has adapted the two stories performed here. In the Henry Heymann Theatre at the Stephen Foster Memorial, 4301 Forbes Ave., Oakland. 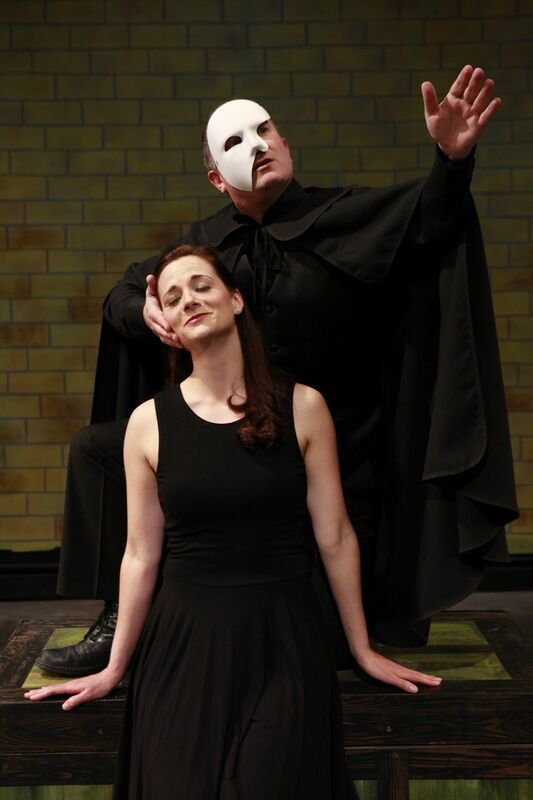 Phantom’s revenge: Gavan Pamer (masked) and Brittany Graham send up Andrew Lloyd Webber at off the WALL. THE MUSICAL OF MUSICALS (THE MUSICAL!) by Eric Rockwell and Joanne Bogart. May 6-21, off the WALL Productions. The Musical of Musicals (The Musical!) is a musical that’s a parody of musicals. If that sounds pretty off-the-wall, it’s not surprising, since off the WALL Productions is the company performing this musically amusing meta-musical. Musical of Musicals is also a classically off-Broadway kind of musical, having premiered there in 2003. The writers were Joanne Bogart—off the WALL is dedicated to doing theater by or about women—and Eric Rockwell. The story has the same basic plot played five times, with each version lampooning the works and musical styles of different composers: Rodgers and Hammerstein, Stephen Sondheim, Jerry Herman, Andrew Lloyd Webber, and Kander and Ebb, in that order. The Musical of Musicals (The Musical!) is therefore the ultimate musical spoof, with more song-and-dance numbers than you might have imagined could fit into a show. Off the WALL is fitting them into the friendly confines of Carnegie Stage, 25 W. Main St., Carnegie. STEPHEN PETRONIO COMPANY (modern dance). May 7 only, presented by Pittsburgh Dance Council. Pittsburgh Dance Council wraps up its current season with a visit from a company that’s been at the cutting edges of modern dance since its founding in 1984, the Stephen Petronio Company of New York. Petronio often choreographs his pieces to music by contemporary rock, pop, or electronic artists. The dance in the video above is set to music by Son Lux—and no, the video does not rely on slo-mo and speeded-up digital effects; the dancers actually move and shift gears that dramatically. Petronio’s company also makes dramatic use of physical stage props. In one part of the Pittsburgh show, they’ll dance a revival of choreographer Merce Cunningham’s “RainForest,” a 1968 piece performed amid a swirl of Andy Warhol’s famous floating “Silver Clouds.” The rest of the show consists of two Petronio originals, “Locomotor” and “Non Locomotor.” The Dance Council presents the Stephen Petronio Company in partnership with The Andy Warhol Museum, which helps assure a supply of Silver Clouds for the occasion. 8 p.m. Byham Theater, 101 6th St., Cultural District. ASSASSINS (musical) by Stephen Sondheim and John Weidman. May 12-22, Stage 62. Stephen Sondheim makes seriously good musical comedy out of grisly subjects. Maybe you’ve seen Sweeney Todd and Into the Woods, if only in the movie versions, so how about Assassins? This 1990 musical, set at a fictional shooting-gallery game at a country fair, is about the men and women who have killed or tried to kill presidents of the United States. Booth and Oswald get their turns at center stage, of course, but the most interesting characters are lesser-known assassins. They include the very bizarre Charles Guiteau, who fatally shot James Garfield in 1881, and Lynette “Squeaky” Fromme and Sara Jane Moore, both of whom failed to kill Gerald Ford. Assassins is a long under-appreciated musical that deftly mixes humor and horror. The show’s book (by John Weidman) also paints remarkably human portraits of the individual assassins while exploring the larger themes of social alienation and violence. Stage 62, one of the region’s top community theater companies, is presenting Assassins in the Music Hall at the Andrew Carnegie Free Library, 300 Beechwood Ave., Carnegie. THE GIVER by Eric Coble (from Lois Lowry’s novel). May 13-22, Prime Stage Theatre. One cannot fail to notice that books, plays, movies, TV series, and video games set in a dystopian future society are rather popular nowadays. Heaven only knows the reason for this—well, maybe some sociology departments do—but if you are under 40, odds are good that one of your first favorite dystopian stories was Lois Lowry’s 1993 novel The Giver. It’s widely used as assigned reading in schools, and now you can enjoy it without having to write a paper. Prime Stage Theatre is performing playwright Eric Coble’s adaptation of the chilling tale about a young man tapped to become the Receiver of Memory in a land where Sameness is not only valued, but strictly enforced. At the New Hazlett Theater, 6 Allegheny Square East, North Side. THE LION (one-person musical) by & with Benjamin Scheuer. May 14 – June 5, City Theatre. Theater fans needing a vacation from dystopian satire and postmodern irony might do well to catch Benjamin Scheuer’s The Lion. Scheuer, a singer/songwriter based in New York, has created a one-man stage musical that is said to be warmly humorous and unashamedly uplifting (see the video above). And before you say “Yeah, yeah, for that we could stay home and watch Julie Andrews movies,” consider that the show has been a hit with discerning avant-garde audiences at the Edinburgh Fringe festival, off-Broadway, and elsewhere. The Lion is an autobiographical piece. Scheuer sings and talks about confronting various misfortunes in his life, from his father’s untimely death to his own diagnosis with advanced Hodgkin’s lymphoma. (The performer discussed that episode—musically, of course—in a TEDx talk, and he’s currently cancer-free.) City Theatre has Scheuer and his multi-award-winning The Lion here in Pittsburgh for a three-week run. 1300 Bingham St., South Side. The Front Porch Theatricals company does only two musicals per year and they’re always interesting choices. Past shows have included Next to Normal, the Pulitzer-winning rock musical about mental illness, and Lin-Manuel Miranda’s In the Heights. Front Porch kicks off this year with The Spitfire Grill, wherein the heroine is a young woman paroled from prison after serving a sentence for manslaughter. Seeking a new start, she lands a job at a small-town restaurant where strange adventures await. The Spitfire Grill was adapted by off-Broadway theater artists James Valcq and Fred Alley from a 1996 movie of the same title. Despite not making it to the big time on Broadway, the musical has been a cult favorite among regional companies over the past 15 years; Front Porch is staging it at the New Hazlett Theater. 6 Allegheny Square East, North Side. 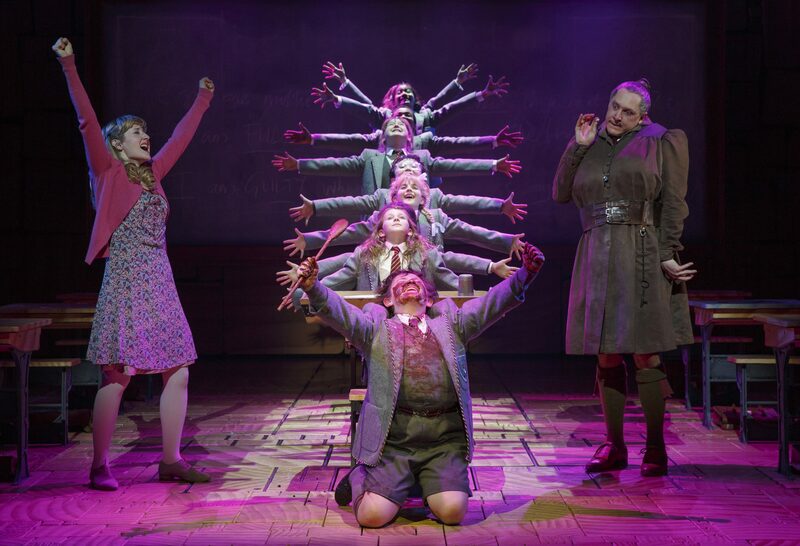 Childhood is strange and Roald Dahl’s vision of it was stranger: This photo from the Broadway production of “Matilda the Musical” may clue you to what the touring show is like. Maybe the sirens aren’t wailing but a Roald Dahl alert is definitely in effect. Matilda the Musical, based on Dahl’s novel about a 5-year-old girl with telekinetic powers, visits Pittsburgh in an acclaimed touring production. Dahl (1916-1990) ranks with Lewis Carroll and J.K. Rowling in the category called “British authors of children’s literature that adults love, too.” A mercurial man who’d had a mischievous and oft-troubled childhood himself, Dahl engaged in fierce combat as a fighter pilot during World War II, then turned to writing wild stories for kids and grown-up kids. Those made into movies include James and the Giant Peach and Charlie and the Chocolate Factory (twice); Danny DeVito’s 1996 film of Matilda used “Send Me on My Way” by Pittsburgh’s Rusted Root as its theme music. Playwright Dennis Kelly and comedian Tim Minchin then adapted Matilda as a full-blown stage musical, premiered in 2010 in England by none other than the Royal Shakespeare Company—which also produced the current Matilda the Musical touring show. If you’re a Dahl fan you know the plot, and if not, bring the children but leave your logic at home. Benedum Center, 237 7th Avenue, Cultural District. Photo credits: TRU, courtesy of Pittsburgh Public Theater. The Rake’s Progress, David Bachman Photography. Edgar Allan Poe, unknown, 1849. The Musical of Musicals (The Musical! ), by Heather Mull. Matilda the Musical, © Joan Marcus.